Home Chef vs. Blue Apron: Which Of The Two Biggest Meal Delivery Services Is Best? It’s safe to say that choosing a meal delivery service can be pretty overwhelming. After all, there are so many out there to choose from and it seems like even more are launching all the time. So, how in the world are you supposed to make a decision? Food Box HQ is here to help make it easier for you! In this post we’re breaking down the differences between two of the biggest meal kits around — Home Chef and Blue Apron. These services are pretty well-known in the industry, so you can count on either one to deliver quality. But which one has the kind of meals you’re most likely to enjoy? Which one has enough servings to feed your family? That’s what you’re going to find out today and much more! No one wants to be eating the same meals over and over again. That’s just boring. Meal kits allow you and your family to try a wide variety of different types of foods from all over. Whether you want to stick to a specific diet (e.g. keto or paleo) or a specific variety of food (e.g. Mexican or Italian) most likely there is a meal kit out there for you. Let’s take a look at the variety of food and meal plans that both Home Chef and Blue Apron offer their customers. One of the main things that’s different about Home Chef when compared to other meal delivery services is that they don’t have an assortment of meal plans for you to choose from. While others have family plans, vegetarian, or gluten-free plans, Home Chef does not. But there’s no need to worry because it doesn’t mean you won’t have plenty of variety each week. How it works is pretty straightforward. Once you join, you’ll be able to let Home Chef know your preferred food/recipes that you’ll be able to have delivered. There will also be available add-ons such as a smoothie or even a seasonal fruit basket. What’s on the Home Chef menu? You’ll find dishes such as: Garlic Scallops over Parmesan Risotto with Blistered Grape Tomatoes and Broccoli, Sesame Teriyaki Steak with Snap Peas and Scallion Rice, Blackened Chicken Caesar Salad with Crispy Shallots, Tex-Mex Turkey-Stuffed Peppers with Enchilada Sauce and Chihuahua Cheese, or Italian Wedding Soup with Meatballs and Parmesan Ciabatta. Unfortunately, for those who are vegetarian, you’re really not going to find many options with Home Chef. There may be a couple of dishes for you to enjoy, but you might be better off finding another option. And for those with food sensitivities, Home Chef does label meals that contain common allergens. Similar to Home Chef, Blue Apron doesn’t offer individual meal plans either. Instead, every customer is presented with the same set of meals to choose from each week. There are no special menus for those who are gluten-free, vegetarian, etc. They occasionally will offer a diet-specific meal plan for a limited time only, like when they offered a Whole30 plan. And while Blue Apron doesn’t provide quite as many meal options as Home Chef, they do offer eight different menu items. If you choose to join Apron, you’ll find a selection of meals such as: Crispy Shrimp & Cilantro Rice with Chipotle Cabbage Slaw, Lo Mein Noodle Stir-Fry with Miso-Roasted Tomatoes & Soft-Boiled Eggs, Crispy Chicken Schnitzel with Mashed Potatoes & Creamy Mustard-Dressed Kale, and Jalapeño Burgers with Goat Cheese & Smoky Carrot Fries. That should be plenty of variety to keep your weeknight meals exciting! For those who are vegan, you won’t really find any options here. Vegetarians, however, will typically find three suitable options each week. For some, that might be okay, while others might wish for a little more variety to choose from. Everyone is always looking to get the most “bang for their buck” and that’s especially true when it comes to meal delivery services. Bigger doesn’t always equal better but it does equal more food. 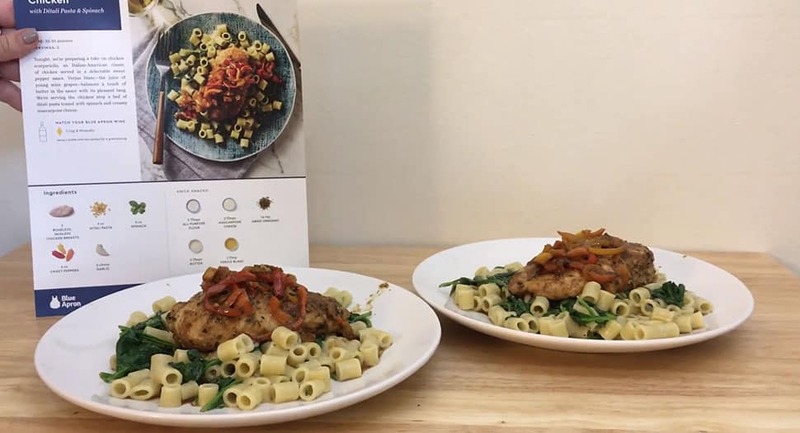 Let’s compare Home Chef and Blue Apron to see what their portion sizes are and if it’ll be enough to feed you and anyone else you’re cooking for. When it comes to portion sizes, each Home Chef delivery will provide you with two or four servings. The two serving plan is plenty for a couple or one person who wants leftovers for the next day. The four person plan is big enough to feed a family of four comfortably or even a family of five with smaller kids who are prone to eat less. In addition to standard meals, you can also opt to receive their 5-minute lunch, smoothie, fruit basket, or premium meals as an add-on. These meals also come in the same portion sizes — 2 and 4 servings. 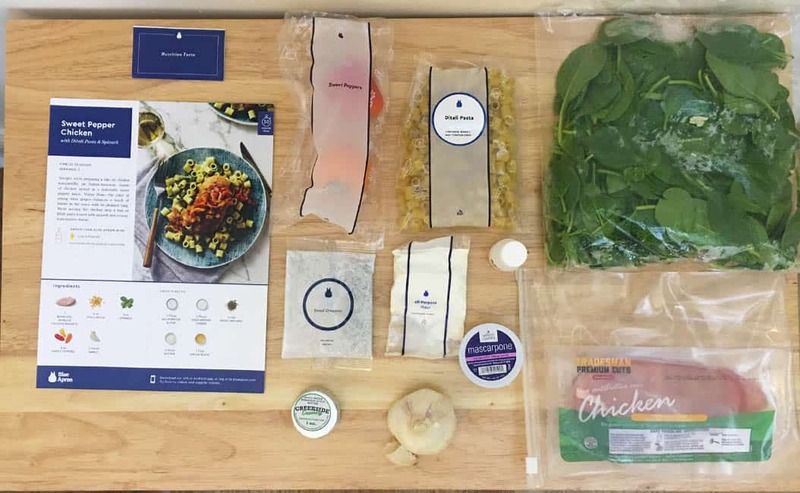 Blue Apron offers the same portion sizes as Home Chef — a 2 and 4 serving plan. You can select from their two-person recipes, which provides plenty for two people or dinner and leftovers for one person. Or, if you have a family to feed, you can select their four-person family plan. There is a difference in the variety of meals based on the plan you choose. If you were looking for already prepared meals that simply need to be heated, Home Chef and Blue Apron will not be the options for you. Both of these meal delivery services provide you with a recipe and pre-portioned ingredients. That means you’ll be preparing each of the meals you make with them. However, that doesn’t mean it’s going to be a hassle! Home Chef and Blue Apron are both designed to make cooking easier since they send you the exact amount of each key ingredient that you need, plus easy-to-follow recipes that can be cooked in no time at all. It’s still going to save you time and effort in the kitchen, which is a huge help. In terms of quality, in our initial reviews, both services sent us untarnished ingredients with which we were able to whip up into a meal. One of the biggest perks of meal delivery services is being able to cook a top-notch meal in the comfort of your own home. However, the key to cooking it right comes down to the recipe card that’s included with your delivery. If the recipe card doesn’t easily allow you to understand what you’re supposed to be doing, your meal could be in jeopardy. Let’s take a look at how Home Chef and Blue Apron structure their recipe cards to make cooking easy. On the front page of the Home Chef recipe card you’ll see the finished meal on display. Next to it you’ll see all of the ingredients that are included in your box. Below the image of the finished meal, you’ll see details about the meal that include nutritional information, prep/cook time, the “best by” days in which the meal should be cooked, the cooking difficulty level, and the spicy level. On the back of the card is where the actual recipe is located. The recipe itself is broken up into numbered boxes with an accompanying image of what the stage should look like as well as a bulleted list of what to do at that stage of the recipe. This type of organization makes following the recipe very simple. Lastly, you’ll see a section for items you’ll need (e.g. salt, baking sheet, pans) and what you should do prior to starting the recipe (e.g. preheat the oven). 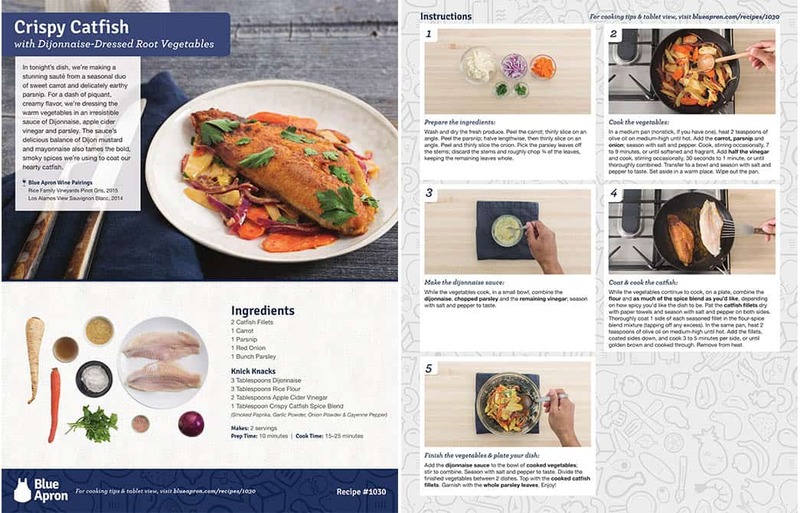 The Blue Apron recipe card is structured somewhat similarly to Home Chef’s. However, there are some subtle differences. Whereas the Home Chef recipe card is horizontal, the Blue Apron recipe card is structured vertically (the way you’d read a regular piece of printed paper). On the front page of the card you’ll see a big picture of the finished meal along with its name, a description, and wine it pairs well with (which you can receive from Blue Apron as an ad-on). Below the image of the meal you’ll see the ingredients listed out along with pictures of them. There are also details such as serving size, prep time, and cook time. On the back of the card you’ll see the actual recipe. It’s broken up into boxes with a picture of the stage of the recipe you should be at as well as a paragraph explaining the recipe below. Being a chunk of text, this can make the recipe harder to follow (especially since it’s small text). When it comes to meal delivery services, you do not want there to be any issues with delivery. One small delay can mean spoiled food. Let’s see how Home Chef and Blue Apron compare when it comes to delivery and shipping. At this time, Home Chef delivers to 98% of the United States. When you go to create an account on their site, you’ll be prompted to put in your zip code. Once you do this, they’ll notify you if you’re within their delivery area or not. If you are, you’re good to place an order! When checking out, you’ll notice that Home Chef orders under $45 will be charged a $10 fee for shipping. If your order is over $45, then shipping is free. You can expect deliveries to arrive anytime between Tuesday through Friday and you’ll be able to choose your desired delivery day at checkout. That means you can pick the day that works best for you. And don’t worry about having to be home because your package will be waiting for you at home when you arrive! If you’re interested in Blue Apron, they deliver to all of the contiguous United States. Unfortunately, that does mean they aren’t able to serve customers in Alaska or Hawaii, but it’s worth checking back to see if they’re able to reach you in the future. Upon signing up and entering your zip code, Blue Apron will present you with delivery days that are available in your area. This will allow you to choose when is the best day to have your fresh ingredients delivered. But just like Home Chef, you don’t have to be home in order to receive the package. Your delivery driver will drop off the package and it will stay chilled until you arrive at home later in the day. This way, you never have to worry about things spoiling. How the meal kit is packed makes the world of difference between a good, bad, and great experience. Bad packaging can lead to damaged or even spoiled food. On the flip side, good packaging keeps everything safe and the right temperature. Great packaging incorporates an environmentally friendly design. Let’s see how Home Chef and Blue Apron stack up. With Home Chef, you can expect your orders to arrive in biodegradable, insulated boxes. To keep everything nice and chilled, they also use water soluble, cool gel packs. After you’ve removed the content of your box, it can be recycled with your local curbside pickup or nearest recycling facility. The gel packs are able to be used again or you can dispose of them. You simply need to drain the gel and recycle the plastic lining. To keep your food fresh while in transit, Blue Apron uses insulated thermal liners and refrigerants so everything stays at the optimal temperature during transit. Depending on the season, the contents of your box, and your location, the packaging may be changed up as needed. This is simply to ensure everything stays chilled and safe to eat. Essentially, this means that Blue Apron may use more or less refrigerants or thermal liners as needed to protect your food. Blue Apron also has a dedicated page on their site all about recycling, which you can find when logged into your account. It tells you exactly how to dispose of the boxes, liners, etc. in the best way for the environment and to cut down on waste. Whether your box gets thrown around by the delivery driver and damaged or the ingredients somehow spoil before getting to you, accidents can happen. When they do, you want to make sure you’re covered. Let’s find out which meal delivery service has the best money back (or satisfaction) guarantee. If you receive a defective product of any kind within your Home Chef order, you can get in touch with them to voice your concerns. They will either reward their customers with a credit or a refund of their money. If they find that part of a product is defective, Home Chef will determine whether or not the customer is entitled to a refund and for how much. Blue Apron customers can feel protected by their “Freshness Guarantee”. If any ingredient in your order is missing or not in an acceptable cooking condition, all you need to do is get in touch with them and let them know. They do require customers to contact their team within seven days of receiving the order, so you won’t want to wait around on this. Make sure you inspect each ingredient upon arrival and you can get in touch right away if needed. The team at Blue Apron will make things right by providing you with a refund or a credit towards future deliveries. Either way, you can feel confident the situation will be resolved. Often times, especially when you first sign-up for a meal kit service, you might have questions. What should I do at a specific step of the recipe? How do I prepare this ingredient for cooking? When will my delivery arrive? Good customer support is an important element in making the meal kit experience run as smoothly as possible. If you need to chat with Home Chef, there are a few different ways you can reach them. You can submit an email request via the contact form on their website or give them a call on the phone. To reach them by telephone, their customer service hours are 9 AM to 6 PM Central Time on Monday through Friday and Saturday from 10 AM to 2 PM Central Time. They don’t accept calls on Sunday. Have a question for Blue Apron’s customer service team? You can either get in touch with them via email or give them a call on the phone. They have a variety of email addresses to help you get in touch with the right person quickly. Just choose the department you need to reach and send off your questions or concerns via email. You can also give them a call six days per week. Their phone lines are open Monday through Friday from 9 AM to 9 PM Eastern. You can also reach them on Saturdays from 11 AM to 5 PM Eastern. Their customer service team doesn’t take phone calls on Sundays, Labor Day, Thanksgiving, or Christmas. Many meal delivery services offer a referral program that allows you to earn credits whenever you refer a friend. With Home Chef, you can save on your future meals by getting your friends and family to sign up through you. They’ll receive a $30 credit toward their first order and you’ll receive a $30 credit in return. It’s a win-win! You can also join Blue Apron’s referral program should you choose to sign up with them. The credit you receive will vary based on the referral code. We’ve seen referral credits as low as $15 and as high as $20. Another fun fact about Blue Apron is that they also have monthly wine deliveries. If you’re a wine drinker and are looking for the perfect glass to pair with your meals, they’ll help you out. Now the moment you’ve been waiting for. Blue Apron vs Home Chef — which one is best? Home Chef has an assortment of add-ons such as their 5-minute lunches, smoothies, fruit baskets, and premium meals. The only Blue Apron add-ons currently available are their wines. Home Chef has an easier to read recipe card (bulleted with more details about your meal). Blue Apron has more vegetarian options. 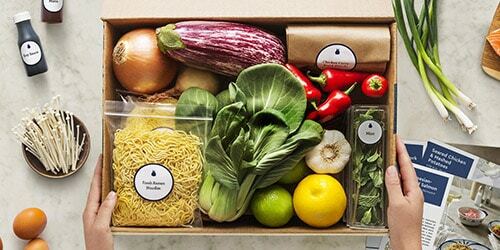 Blue Apron ships to more places within the United States. At the end of the day, both Blue Apron and Home Chef are great meal kits. In both initial reviews, the meals came out delicious. You’ll also find both in our list of top 10 meal delivery services. However, if we had to make an executive decision, the winner would have to be Blue Apron due to its Freshness Guarantee, slightly expanded shipping/delivery, and meal variety. On the other hand, Home Chef does beat Blue Apron when it comes to a key meal kit point — the recipe card. If that is an important issue, definitely consider going with Home Chef instead. Do you have experience using Blue Apron and/or Home Chef? Let us know in the comments below!